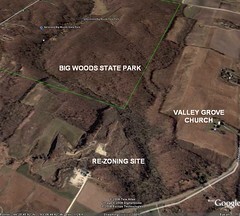 Industrial Zoning in the Big Woods State Park? All who care about Nerstrand Big Woods State Park should be aware that the Rice County Board of Commissioners will soon vote on a request to re-zone 55 acres inside the statutory boundary of the park, and they will be discussing it a second time at their meeting February 12. The Commissioners have the final word, following a unanimous denial by the Planning Commission in January. This remote and scenic area at the northeast corner of the park has had limestone mining for decades, a use that is permitted in the current agricultural zone; but the land is now for sale. The current owner (Doug Kielmeyer) seeks to re-zone the property permanently to the advantage of one potential new owner, and to the disadvantage of all those from the county, state, and beyond who treasure this park. Permissible uses in the light industrial zone could include a truck terminal, recycling facility, office building, auto sales, shooting range, adult entertainment, and more—uses inconceivable within an ecologically fragile park setting. Let’s honor the work of many who have put time and expertise into these documents and re-zone only when it furthers the goals and principles on which they are based. We urge you to contact your county commissioners before Feb. 12 to express your concern, urging them to deny the re-zoning request. Submitted by Bright Spencer (not verified) on Thu, 02/07/2008 - 6:43pm. Sent the email to save the 5 acres for nature...thanks for the heads up! Please make the contact, it's less than a minute or two at most.